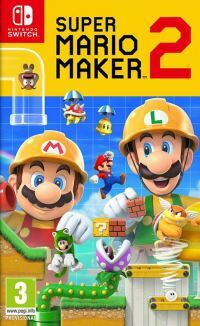 Super Mario Maker 2 is a continuation of the warmly acclaimed editor that allows you to create your own levels from Super Mario games. The title was developed by Nintendo. In Super Mario Maker 2 the action was shown from the side. In the course of the game we build platform levels, deciding on the topography of the terrain, setting up elements of the scenography such as bricks and pipes, as well as deploying opponents and power-ups. In the list of elements absent in the first part of the series you can find the possibility of creating slides (where the hero slides, eliminating opponents standing on his way), power-up known as Lucky Bell (allowing the protagonist to climb the walls), as well as a lot of new types of backgrounds. The whole is operated by a simple and intuitive interface. The game allows you to test the created stage at any time, to make any corrections if necessary. You can share your work with other players, but the condition for the publication of a given stage is its one-time completion. In Super Mario Maker 2 players can use several graphic styles, taken from the following games: Super Mario Bros. 3, Super Mario World, New Super Mario Bros. U and Super Mario 3D World. The same applies to the sound layer. Expectations: 8.0 / 10 calculated out of 8 players' votes.